1. Grind the soya balls in a mixie for 5 seconds. 3. To the green gram, add cumin seeds, saunf, peppercorns, ginger and grind coarsely. 4. Add soya and grind again. 6. Saute the onions, curry leaves and add to the batter. 10. Cook on both sides. 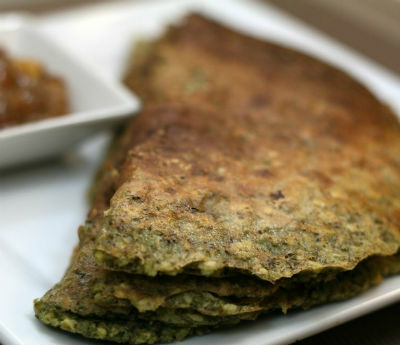 Feel free to comment or share your thoughts on this Soya Onion Pesarattu Recipe from Awesome Cuisine.